Built on one of the main streets in town, we're happy to have you over and help you enjoy your time in Antigua. Our location makes for a great starting point to explore the city and is the perfect distance away from the buzz to ensure a restful night. Antigua is best explored on foot so when you come back ready to relax, our cozy and clean beds will be waiting, along with our hot tub and bar in case you feel like knowing about other people's adventures. 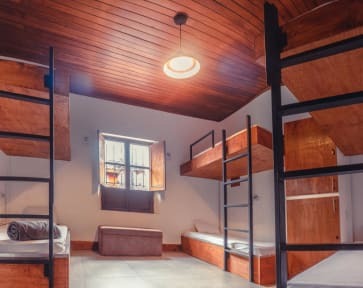 If you feel like staying in, our place is fully equipped with an amazing kitchen, in-house laundry, charging outlets in each bed, hot showers and added perks, such as a TV with Netflix, guest computer and comfy hammocks and sofas. 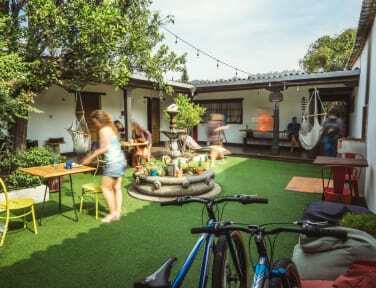 Find the perfect mix of social and chill while surrounded by fruit trees and roses in our common areas and choose from our carefully designed and 4-bed, 6-bed, and 8-bed dorm options and private room for two. Come to our front desk so we can let you in on all the secrets about Antigua and help with arranging your trip to your next destination. Please note: Front desk is open from 7 am to 9 pm, however there is always security personnel after hours.